George Rollins has had something of a homecoming over the last two months. The former budget manager for the vice president of student services is back on campus, this time as the new director of the Bearkat OneCard office. “I was looking for a reason to come back to Huntsville. All of my family is here and it was a timing thing. Things just happened to work out, I found a nice position and things moved forward,” Rollins said. 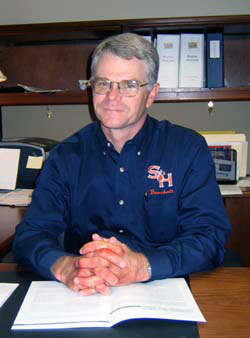 Rollins is also an SHSU alumnus receiving his Masters Degree in business administration in 1992. His work prior to coming to SHSU has included acting as manager of the Underwood ranches in Austin County as well as operations manager for LOR, Inc., the sixth largest cattle operation in the country. In addition to keeping him close to home, Rollins decided that his work as director would add some much needed variety. And though he has only been in the position for a scant two months, Rollins already has some ambitious goals for the Bearkat OneCard. “Higher One has entered discussions with us about their banking services with us and there’s some university aspects of it that we’re going to be looking into to see if we can have them added to the program,” he said. “We also hope that we can get some additional services going for students such as online banking through the account and we are also working on programs in which student groups could use the Bearkat OneCard. Furthermore, Rollins also stated that his goals include encouraging more students to take full advantage of the OneCard’s uses. “I’d like to have a higher percentage of students with activated One accounts with the debit card features and also to achieve more who will choose to have their preference as having their refund being direct deposited to their One Account,” he said. Thelma J. Douglass, vice president for student services, said she was pleased that Rollins is returning in his new capacity. Douglass directed planning and implementation of the OneCard program, which is considered to be one of the most innovative on any university campus. "I am pleased to announce the hiring of Mr. George Rollins as the new Director of Bearkat OneCard Services," said Douglass. "Mr. Rollins brings a wealth of business knowledge, experience, and expertise back to his alma mater and I know he will do an excellent job for the Division of Student Services and the University. "Mr. Rollins is returning to the Division of Student Services after several years of employment in the ranching industry. We welcome him back to SHSU and we know that he will provide a seamless transition in operating the Bearkat OneCard Office."